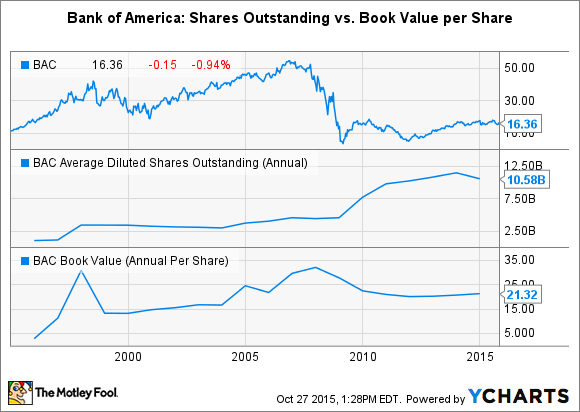 Because its shares trade for a large discount to book value, buying back stock, as opposed to raising its dividend, is the fastest way for Bank of America to boost shareholder returns. Shareholders in Bank of America (NYSE:BAC) have been breathing down its neck over the last few years, anxiously awaiting a consistent stream of annual dividend increases. But with shares of the nation's second biggest bank by assets still trading for a steep discount to book value, the most effective way for it to generate shareholder value is to favor stock buybacks over dividends. All of this is assuming that Bank of America has the luxury of choosing between these two options, which isn't a given. I say that because it's struggled in three out of the last five stress tests, during which the Federal Reserve exercises veto power over the capital plans of the nation's biggest banks. In this year's test, for instance, the Fed told Bank of America that it may "restrict the company's capital distributions" in 2016 if the bank doesn't address weaknesses uncovered in its capital-planning process. But, again, assuming Bank of America clears this hurdle, which seems like a reasonable assumption, it should nevertheless strongly favor stock buybacks over a higher dividend. This follows from the fact that Bank of America's shares currently trade for a 26% discount to book value, according to data from Yahoo! Finance. Buying back shares in this case is akin to paying $0.74 to boost net worth by $1 -- good business if you can get it. Bank of America's chairman and CEO, Brian Moynihan, seems to agree. "We need to get back most of the shares we issued in the crisis, that caused all the dilution," the 55-year-old executive told Fortune's Shawn Tully in 2011. Moynihan was referring to the fact that Bank of America nearly tripled its outstanding share count in the wake of the financial crisis. And it did so after the bank's share price had plummeted, resulting in an egregious dilution of existing shareholders. Another reason that Bank of America should prefer buybacks over dividends is because the Fed does, too. The hypothetical scenarios that underlie the stress tests presume that a bank won't cut its dividend if the economy were to experience another economic cataclysm akin to the financial crisis. In the absence of abundant and offsetting profits, which Bank of America has yet to achieve, this depletes a bank's capital for the purposes of the stress tests and thereby jeopardizes its performance. Share buybacks, conversely, aren't presumed by the central bank to continue during a severe economic contraction, and thus don't have the same effect on a bank's stress-test performance. Thus, for both regulatory and value-related reasons, Bank of America would be better off for the time being returning capital to shareholders via buybacks as opposed to raising its dividend.